Members of a military choir await the beginning of ceremonies for the late former U.S. President George H.W. Bush inside the U.S. Capitol rotunda in Washington, D.C., Dec. 3, 2018. 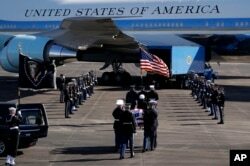 Bush was sent off from his home with a 21-gun salute and his casket was taken to Andrews Air Force Base, in Maryland aboard the presidential aircraft, made available by U.S. President Donald Trump. Ameer Hassan of New York stops to sign the condolence book as the official portrait of former President George H.W. 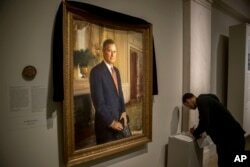 Bush is draped in black cloth at the National Portrait Gallery in Washington, Dec. 3, 2018, to mark his passing. Bush will lay in state at the Capitol building this week before being buried in Texas. "As a young man, he proved his valor in the toughest circumstances. And for the rest of his life he was the same kind of public servant, committed to us all," Mattis told reporters at the Pentagon on Monday. "It's pretty obvious as people look back, and as people are recollecting the Bush presidency, it looks a heck of a lot better than it did at the end of it," he said. "Bush of course was defeated for re-election and most people at the time considered him a failed president" because of a recession during his time in the White House. "But now I think we can see in retrospect that he was actually quite successful," Sabato added, particularly in foreign affairs, as he helped shape the Western response to the demise of the Soviet Union and the reunification of Germany. He also led the U.S. to a military victory in reversing Iraqi dictator Saddam Hussein's takeover of Kuwait. FILE - Former President George H.W. Bush attends a ceremony to unveil a new garden named in his wife's honor, Sept 29, 2011, in Kennebunkport, Maine. "To be honest, at one point in history," he said, "it would not have been exceptional to have a president who obeyed and appreciated the norms of the American system and of the presidency, who was civil, who was kind to people and who rose above petty squabbles. But you know, things have changed, particularly in the last couple years. And the contrast between George H.W. Bush and the current president could not be more stark." The flag-draped casket of former President George H.W. Bush is carried by a joint services military honor guard to Special Air Mission 41 at Ellington Field during a departure ceremony Monday, Dec. 3, 2018, in Houston, Texas. James Baker, Bush's former secretary of state and his friend of 60 years, told CNN on Sunday he considered Bush as "the most kind and considerate person I ever knew." 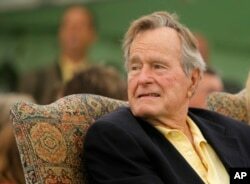 He said Bush's "quality of life had deteriorated a lot" in recent months, but that near the end he was able to talk by phone with his adult children, including former President George W. Bush. Baker said the elder Bush's last words were, "I love you, too," spoken to the younger President Bush, the country's 43rd president. "The president and first lady were notified late last night of President George H.W. Bush's passing," Sanders said in the Saturday statement. "President Trump is scheduled to speak with President George W. Bush this morning and offer his condolences on behalf of himself, the first lady, and the entire country. A state funeral is being arranged with all of the accompanying support and honors. The president will designate Wednesday, December 5th as a National Day Of Mourning. He and the first lady will attend the funeral at the National Cathedral in Washington, D.C."